Part of the joy of my small business is seeking inspiration for all things vintage, upcycled and environmental. For anyone searching for similar, I can honestly say that a couple of my favourite days were recently spent attending the relatively new The Glamping Show which has just held its second annual event. And it was just lovely! I now have serious aspirations, not just to go glamping but somehow to secure the land, investment and wherewithal to create my own site. It may well be some way off but there were definitely seeds sown and food for thought from this great event. Although if I’m honest, these guys from the Alpaca Alliance pretty much stole the show and my heart! There’s a brilliant shop in Leamington Spa that has been guiding and supporting sellers of vintage, retro and handmade for the past couple of years. They are actual-honest-to-goodness award-winners! And rightly so! Blighty Bazaar in Leamington host over 120 sellers in a labyrinthine space packed with treasures from independent small businesses – from vinyl to vintage, curios to clothing, handmade and plenty more. To say that Vintage Revisited is excited to be one of them would be an understatement! It really is a joy to be involved with such a supportive, creative team. The friendly and informed staff have guided us through the process of cataloguing and displaying our stock and we are so proud of our little space alongside all the other amazing sellers. Vintage Revisited at Blighty Bazaar – a quirky and eclectic mix of handmade, vintage-inspired items and treasures from the brocantes of France. We’ve started with a small selection of our handmade, vintage-inspired creations and teamed them with some favourite finds from the brocantes of France. As a taster, you’ll find our hand printed Pride & Prejudice bunting alongside vintage French potato mashers, retro champagne buckets next to hand sewn cushions and recycled knitwit bags nestled in with Welsh wool blankets. We’re pretty sure that there’s something to tempt everyone. The only problem we’ve encountered so far is a burning desire to snap up stock from the other stall holders – it’s virtually impossible to leave the shop without a little something that you can’t possibly live without! Winners of National Vintage Awards Best Regional Shop, Blighty Bazaar is firmly established as a favourite haunt for sellers and shoppers alike and Vintage Revisited is delighted to be a part of it. Wow! I can’t believe that it’s been so long since I wrote anything on here. I have been massively busy with ‘proper’ jobs and I can’t deny that there have been times when I’ve thought about abandoning Vintage Revisited – not because I don’t love it (I absolutely do!) but sometimes, it’s a bit too easy to lose faith. I love making and creating from the various bits and pieces of vintage and retro that I find: I don’t think I’ll ever tire of working out new ways to re-invent scraps of fabric, re-use found buttons or upcycle abandoned pieces of furniture. 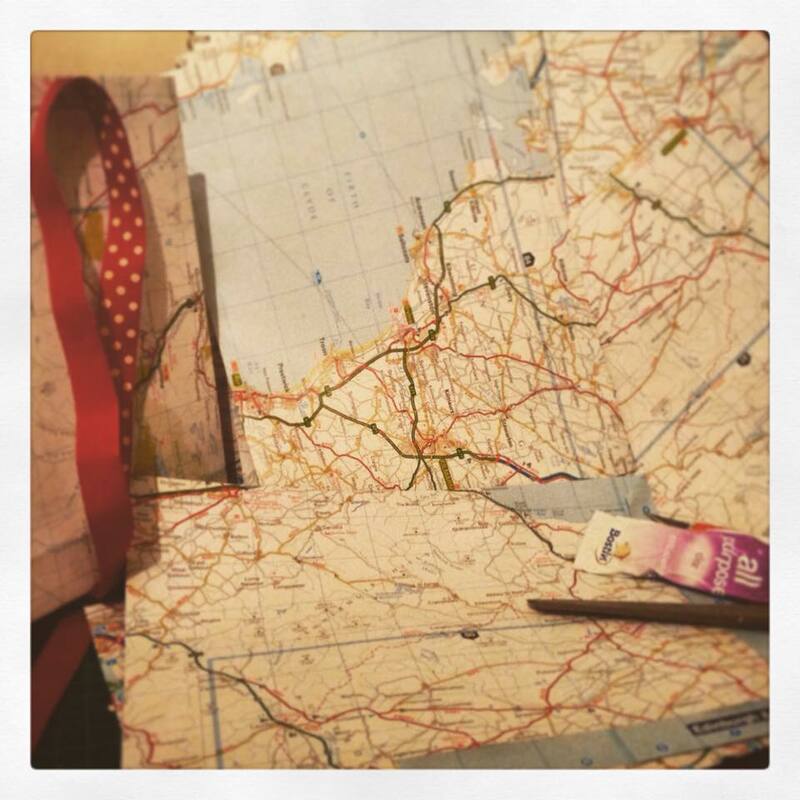 Using old atlases to make gift bags, tags and cards is a great recycling tip and guarantees a unique piece every time. Some ideas I love sharing – making old atlases into gift bags, tags and cards is such a great thing to do and guarantees that every piece is absolutely unique – but working out a pattern, spending hours hand-sewing and pricing it at a fraction of actual time and cost makes you yearn for trumpet heralds, drum rolls, whoops of joy or even just a pat on the back. But I have to remind myself, that’s not why I do it – I love it, I really do. So, if ever you meet me at a craft fair and I seem a little disheartened, make my day and remind me that every piece on my table carries a little bit of my heart and actually, the delight for me is when someone understands that and believes in me enough to buy and share that joy. 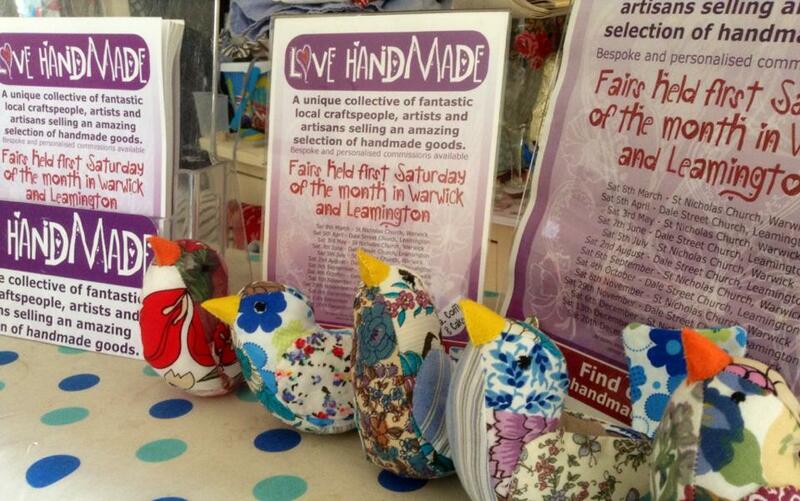 I have been lucky enough to join up with a local cooperative of artists, artisans and designers, Love Handmade who have been immeasurably supportive in my endeavours. We remind ourselves often that what we are achieving may not bring about world peace or even rock everyone’s world, but hopefully, we all manage to spread a little bit of happy with our handcrafted pieces – we’re pretty sure that the cake we serve at our events does! The trouble with January is that I find it difficult to get motivated. I know it’s meant to be a time of girding the loins, setting forth and re-inventing the “new me” but to be honest, I find that the relentless autumn (which is what a UK winter really is) begins to pale… but at least the days are getting longer! And I am quite excited about a find I made in one of our local craft shops… cute little canvas and easel sets. I’ve decided that they’ll make fantastic greeting cards – I’ve been so inspired by them that I even got round to making a five just today. I’ve used acrylic paints and personalised them specifically. 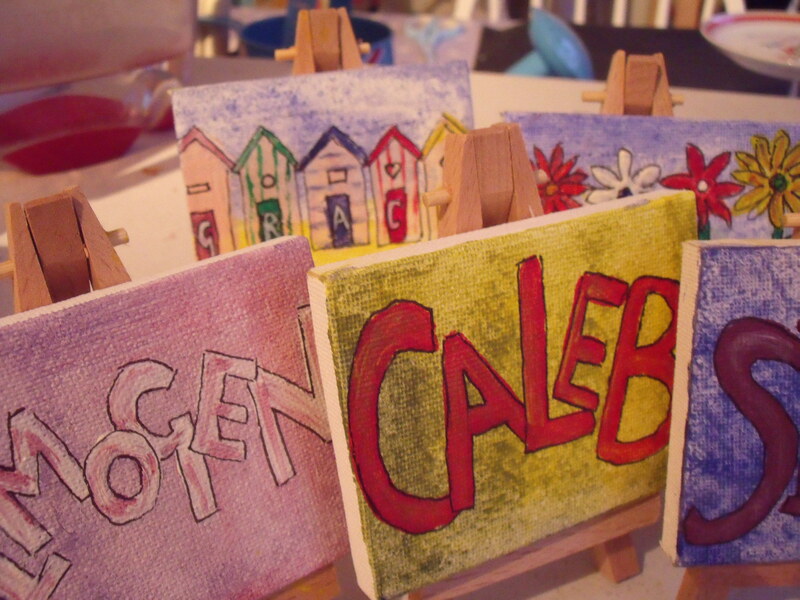 I love these – and challenge even the most art-averse person to mess up! They’re dinky enough not to demand too much skill or be overwhelming but not so small that they don’t make an impact. Oh, and I updated the website… see, another thing ticked off the list (see http://www.vintagerevisited.co.uk and let me know what you think)… it’s like I’m taking January by storm! Thank you so much to all the people who have been supportive and encouraging of everything we try to achieve at Vintage Revisited over the past year. In line with most things, it’s never just “plug and go” is it? So, to all those who came to the Craft Fairs or got involved in the Creative Christmas Craft evenings, A HUGE THANK YOU! I’m hoping to update the website over the Christmas and New Year period which should mean that all our fabulous creations are more easily accessible and you’ll be able to just “click and buy” – so look out for that. Already a month since I last posted anything! Obviously, I’d like to claim that I’ve been hugely busy achieving vast amounts of good things (world peace and an end to poverty would be good) but sadly, no such thing. I have done a couple of craft fairs with moderate success and have managed to get most of the preparations sorted for the Christmas Craft Evenings that I’m running, so getting there… slowly! At one of the Craft Parties, I’m rolling out a new idea – each person is given a plain coloured, unadorned dolly bag (obviously using the crafty pattern outlined in a previous post that recycles disks and cds) and they then get to rediscover their hidden sewing skills by attaching ribbons and all manner of beads, baubles and glittery bits and pieces. I’ll post pictures of the event. I’ve also surprised myself by creating some Christmas wreaths… made with sweets! They are fantastic so I’ll definitely get round to sharing that process soon… very soon. Not Christmas itself; I love Christmas and all that goes with it. But, in terms of work, there are so many bits and pieces whizzing around inside my head, that it all becomes a bit bonkers. Having said that, whilst there is so much to do in terms of creating stock and preparing for all the forthcoming fairs, it is hugely exciting and this week I will mostly be creating… (imagine drumroll there) Christmas bunting!